The missiles were fired from a submerged position by the submarines Veliky Novgorod and Kolpino from the Black Sea Fleet. They obliterated the terrorists’ command centers, communications lines and ammunition depots to the east of the city up to 650 kilometers (more than 400 miles) away. “[Deir ez-Zor] had been besieged by Daesh for three years and all attempts to liberate it had previously failed. However, seven strikes by long-distance Kalibr missiles were enough to destroy the terrorists’ positions and leave dozens of them dead, thus making it easier for government forces to flush the rest of them out,” retired colonel and defense expert Viktor Litovkin said. 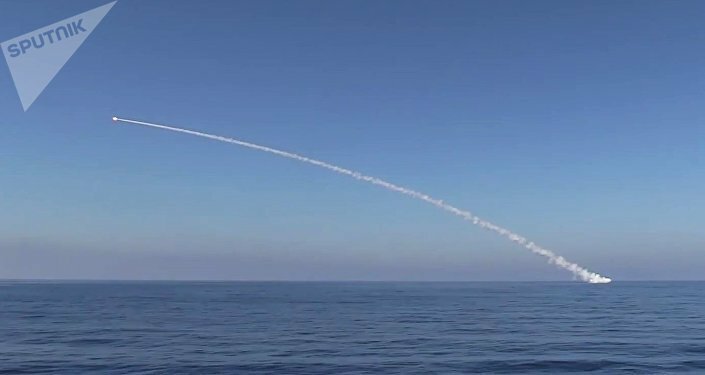 On September 5, the Black Sea Fleet frigate Admiral Essen launched strikes with Kalibr cruise missiles on Daesh targets in Syria as part of an operation to free the city of Deir ez-Zor. That same day the Syrian Army, backed by the Russian Aerospace Forces, extricated the city. Syrian government forces are now continuing their advance while facing fierce resistance from the militants still holed up in Deir ez-Zor. “The Kalibrs are a high-precision weapon and their underwater launch from the Veliky Novgorod and Kolpino submarines attests to the high combat readiness of our sailors and the great efficiency of Russian-made missiles. [Thursday’s] strike has brought closer the day when Syria is liberated from terrorists of every hue who still remain there,” Litovkin added. Kalibr missiles are able to hit objects at a distance of 2,600 kilometers (more than 1,600 miles) and can overcome any anti-aircraft and anti-missile defense system. When flying, they constantly change altitude and direction making their detection a nearly impossible task. The breach of the Deir ez-Zor blockade is an important landmark that will lead to the complete defeat of the most combat-effective formations of the Daesh terrorist group in Syria.